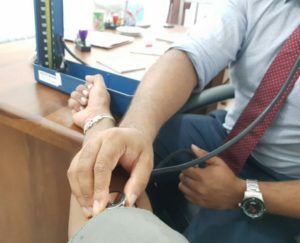 The essence of our Primary Healthcare Centre is to provide a first point of contact in the healthcare system for patients and allow for disease prevention and illness follow up to take place. In addition, we thrive to provide a "five-star doctor" service involving personalized and family care which is comprehensive and enables coordination between other levels of healthcare. We are focused on confronting important and common major illnesses like cancer, obesity, smoking related illnesses, cardiovascular and metabolic diseases, childhood illnesses, infection, allergies and palliative care. Primary health care is delivered mainly by general practitioners and their practice teams, and provide over 60% of all patient interaction in the health system. There is compelling evidence that the forte of the primary health care system in a region or nation correlates to the health status of that population. Hence considering these factors along with the rise of non-communicable and regular communicable diseases, research in primary care is of utmost importance to provide exceptional clinical (including population-based) care, to improve the health system and policies, as well as for educational purposes of the next generation of primary care professionals. The primary objective of the National research centre in primary care is to enhance the research and capacities of the basic, clinical, public health and other connected scientists in University of Sri Jayewardenepura, by carrying out relevant and highly scientific research on infections, non-communicable diseases and malignancies that would have a direct impact in providing solutions to the major health issues in Sri Lanka as well as globally. Secondary objectives are to facilitate collaborative studies among University of Sri Jayewardenepura scientific community and attract other researchers to primary care research in their specialties and bring a wealth of experience to their work. Training government doctors from Western province in Family Practice.